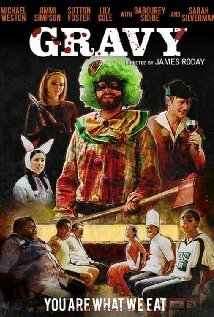 Tag line: "You Are What We Eat"
Directed by James Roday, Gravy is, thus far, the find of the Halloween season, a horror / comedy that delivers on both counts, and in a big, big way. Another All Hallows Eve has rolled around, and brothers Stef (Jimmi Simpson) and Anson (Michael Weston) are ready to celebrate it in their own unique way. Joined this year by Stef’s abrasive girlfriend Mimi (Lily Cole), the brothers walk into a Mexican bar / restaurant at closing time, take the entire staff hostage, and announce everyone’s been invited to attend a special feast. Alas, most of the unfortunate employees won’t make it to the dessert course; in what has become a Holiday tradition, Stef and Anson (and Mimi) intend to eat each and every one of their prisoners before the night is out! Balancing comedy and horror can sometimes be tricky, but Roday and his exceptional cast manage to pull it off. The laughs come courtesy of a smartly-written script (penned by director Roday and Todd Harthen), which gives weight to its characters without the benefit of delving too deeply into their back stories (for instance, we never learn why Stef and Anson carry out this macabre annual tradition). Simpson and Weston are hilarious as the siblings with a palate for human flesh who, unlike their victims, are having the time of their lives (from start to finish, they’re as giddy as kids on Christmas morning). Though a bit more sadistic than her cohorts, Lily Cole’s Mimi also gets in on the “fun”, taunting and ultimately torturing the pathetic Bert (Ethan Sandler), whose girlfriend recently left him for another woman. Also making a brief but memorable appearance is Sarah Silverman as Bethany, a nervous cashier who, in the film’s opening scene, captures Anson’s heart. As for the horror, Gravy does have its moments of violence and gore (most of which occur in the kitchen), but the true terror lies both in the situation itself (innocent people knowing from the get-go that they likely won’t survive the night), and the fact it’s happening to these specific characters, who, in the handful of scenes we spend with them before all hell breaks loose, seem more like a tight-knit family than a team of co-workers. Funnyman Paul Rodriguez, playing against type, is the boss / father figure Chuy, the one they all look up to, while Lothaire Bluteau’s Yannick is a world-class French chef who, it turns out, is hiding a secret or two of his own. Even more upsetting is that a few of the potentially doomed employees had bright futures ahead of them; Sutton Foster’s Kerry was working her last shift, and about to start a new career as a healthcare professional, while security guard Winketta (Gabourey Sidibe) spent the earlier part of the evening preparing for her final history exam. Rounding out the victim’s list is Hector (Gabriel Luna), Chuy’s nephew who dreams of becoming a cage fighter; and Cricket (Molly Ephraim), an occasionally obnoxious waitress whose bad habits prove useful later on. Each of these ill-fated characters is as well-rounded as their captors, and we root like hell for them to somehow make it out of this nightmare alive. To be honest, I have no idea if Gravy will hold up as well on repeat viewings; the story has its share of twists and turns, and its makers rely heavily on the element of surprise to keep the audience on its toes. What I can say, though, is that, the first time through, this is one of the most entertaining movies I’ve seen this year. It’s a bit early to be talking about a top-10 list for 2015, but if I were a betting man, I’d lay money Gravy will land somewhere on mine.